Thanksgiving is the perfect time to be grateful. And there is no better way to express gratefulness than to share an example of good will by some greats. By greats, I mean the Boston Red Sox. As a kid growing up in New England, I attended my share of Red Sox games at Fenway Park. And as far back as I can remember, the Sox were always involved in activities and events to raise money for The Jimmy Fund. Back then, I didn't know what The Jimmy Fund was, but knew it must be important because my favorite players were involved. Red Sox Hall Of Famer Rico Petrocelli inspires enlightenment. Years later, shortly after making a move to the opposite coast, I wrote to former Red Sox shortstop Rico Petrocelli. Like many fans, I wanted to ask for an autograph, something to associate with my memories of the game. At his request, he suggested a nominal donation ($5, I think) to The Jimmy Fund. I was glad to make the donation. But more importantly, it inspired me to learn more about The Jimmy Fund. The Jimmy Fund was established as far back as 1948, shortly after a 12-year-old boy named Einar Gustafson suffered from pediatric cancer. While tragic, he had the good fortune to be a patient of Dr. Sidney Farber, founder of the Dana-Farber Cancer Institute. Dr. Farber is legendary for his pioneering work in modern chemotherapy. Gusfafson was asked to speak on Truth of Consequences, a national radio show, with an appeal, which aired in May 1948. Gusfafson, who spoke on the show from his hospital bed, was dubbed “Jimmy” to protect his privacy, but his appeal drew donations totaling more than $200,000, all of it slated to help Dr. Farber’s research. This was the birth of The Jimmy Fund. Since, more than $600 million has been raised toward eradicating childhood cancers. How does this connect to the Red Sox and baseball? The Dana-Farber Cancer Institute is located in Boston (Brookline, to be exact) and the team chose The Jimmy Fund as its official charity in 1953. Everyone, from players to owners, embraced the charity then and have remained committed ever since. 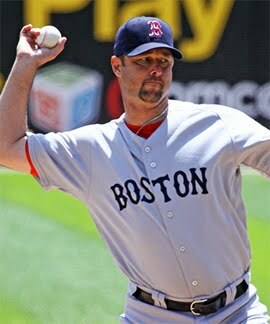 This includes the team’s 2010 Jimmy Fund co-captains and pitchers, Tim Wakefield and Clay Buchholz. They have been leading the charge to help raise awareness about the The Jimmy Fund. But there is much more to it than that. "Every time I walk out to the mound and see that Jimmy Fund emblem out on the Green Monster, I am reminded of the special role the team has played in helping fight cancer since Ted Williams was visiting with patients at Dana-Farber back in the 1950s," says Wakefield. "I'm proud to be a part of it." Wakefield does much more than think about The Jimmy Fund. He is an active participant and even took the Red Sox's 2004 World Series trophy to Dana-Farber Cancer Institute so Jimmy Fund Clinic patients could lift it. It also lifted their spirits. He is not alone. Many players visit the children being treated at Dana-Farber and support fundraising events. One of the events, Jimmy Fund Fantasy Day at Fenway Park, even allows participants to step to the plate or hit the field. Another event, New Stars for Young Stars, includes autograph signings to raise money for the fund. And, every year, you can catch a radio telethon broadcast on WEEI Sports Radio and NESN. Recently, Wakefield has taken his role a step further, creating the "Wakefield Warriors," which enables him to meet pediatric patients from the Jimmy Fund Clinic or Franciscan Hospital for Children at Fenway Park before Tuesday home games. The kids love him for it. And we do too. The Jimmy Fund And The Wakefield Warriors Are A Liquid Hip Good Will Pick. But the way we see it, you don't have to be a Red Sox fan to appreciate the good work being done at Dana-Farber through The Jimmy Fund. In fact, The Jimmy Fund has consistently earned 4-star ratings by Charity Navigator for its fiscal excellence. Less than one percent of rated charities ever receive a 4-star rating. If you would like to learn more about The Jimmy Fund, we encourage you to visit the website or Facebook page. The Jimmy Fund even has a special section for Red Sox fans, which includes gifts and information on how to obtain an RS plate if you live in Massachusetts. Proceeds support The Jimmy Fund and we're grateful.